While at Shirdi, Baba used to converse with those coming to Him, give advice to them regarding their problems and offer courage and solace to them with regard to their troubles. In this manner, Baba’s activities came to be known all over the country. At that time, there was in the Maharashtra State, a deputy collector and settlement officer by name, Hari Vinayak Sathe. He was grief stricken over the passing away of his wife. Prof. G.G. Narke, a friend of Sathe, came to his house and advised Sathe that there was no purpose in grieving over his loss and that it was advisable for him to have a change of place to get over his sorrow. He suggested that it was good to have the Darshan of some saint and persuaded him to come to Shirdi. Sathe was quire an extraordinary person. On reaching Shirdi, he and Narke had Darshan of Baba. On several occasions, looking at Sathe, Baba used to laugh, sing and make strange gestures. Doubts arose in Sathe’s mind whether Baba was a real sage or an eccentric person. Non one mentioned anything about Sathe to Baba. Sathe and Narke merely went to see Baba and sat in His presence. Baba told Sathe, "Don’t worry about anything. Bodies are like water bubbles. Do not develop any attachment to the body. Develop your attachment to the indwelling spirit (Dehi). Worries are like passing clouds. They happen to every individual. Have courage. Protect your child." The last remark had reference to the fact that Sathe’s wife had died giving birth to a child. Even Narke had not heard about the survival of this child. On hearing Baba’s words, Sathe realized that Baba was not a crazy person but one who was a Trikala Jnani, who knew the past, present and the future. Sathe who had intended to stay for a short while just to have Darshan of Baba, prolonged his stay by two more days. Making frequent visits to Shirdi, Sathe was the first to realize that there were no proper accommodation amenities at Shirdi for those coming to Baba. He provided residential accommodation for visitors at a place known as "Sathe Wada". While serving in this manner, Sathe went again to Shirdi after he began to feel whether there is any purpose on his continuing to earn income and accumulate wealth. On seeing Sathe, Baba smilingly said, "You appear to be losing interest in your job. You are wondering how to dispose the wealth you had acquired. Why give it anyone? Use it for good cause. Build a ‘Kothi’ in Shirdi." Sathe told Baba, "Swami! I am not a millionaire. How can I build a mansion here?". Baba replied, "Go on doing as much as you can. Why fear when I am here? "Baba encouraged Sathe in this manner. In due course, Sathe’s maternal uncle, Kelkar, settled down in Shirdi. Sathe used to send funds from Poona and his uncle used to carry on the constructions in Shirdi. In this way, Baba used Sathe as His instrument. He regarded Sathe as His right hand with regard to all matters. Because Baba was keeping Sathe close to Him and relying on him for everything, the residents of Shirdi grew jealous towards him. "Many are content to do nothing themselves, but they cannot bear seeing others do things and will carry tales against them!". Several persons used to come to Baba and tell stories against Sathe. What is the appropriate name for such talebearers? They should be called "enemies of beggars" (namely barking dogs), declared Baba. At Shirdi, Baba used to do notable things. One was to receive money from whoever came to Him. He used to ask for "Dakshina" (cash offering). He did not ask for large sums. It was two rupees or five rupees. He would receive the money and give it away immediately in their presence. He kept nothing with Himself. One day a man by name Pradhan came to Baba. He had intended to offer twenty rupees to Baba. In those days, there were no currency notes; everything was in silver coins. Unlike the alloy coins of today, in those days every rupee contained one tola (eleven grams) of silver. Pradhan thought that instead of offering so many silver coins, it would be better to offer one gold sovereign to Baba. Baba turned the sovereign this way and that way and remarked, "How is it I have not seen such a coin before?" A person near Baba said: "It is a gold coin!" Baba then observed, "I do not want this. Give Me money in rupees." He asked how much the sovereign was worth. At that time, it was worth fifteen rupees. Getting back the sovereign, Pradhan gave fifteen rupees to Baba. Immediately Baba remarked, "Pradhan! You have to give Me five more rupees!" Pradhan was a judge at that time. Pradhan as well as persons around him wondered why Baba was demanding five more rupees when a sovereign was worth only fifteen rupees. Noticing Pradhan’s hesitation, Baba told him, "First hand over the five rupees and then think about it." Pradhan gave the five rupees. Then Baba observed, "When you set out of your home, how much did you want to offer to Baba? You intended to give twenty rupees. You gave only fifteen. So I was entitled to ask for five more." When Pradhan heard these words, he was stupefied. He admitted that SAI BABA was a good judge. In this manner, Baba was in the habit of collecting money from those who came to Him and giving it away to the needy. One day, He summoned Kelkar and told him, "Today is Gurupoornima. Perform Guru Puja to Me." Non one there knew the meaning of Guru puja. Kelkar asked Baba what Guru puja meant. Baba asked, "Whom do you think as a Guru? It is not pontiffs of ‘maths’ who are Gurus. Nor are sanyasins (renunciants) are Gurus; God alone is the Guru (Preceptor)." He is the Supreme Absolute. Salutations to that Supreme Guru. The true Guru is one who combines the three forms of the trinity, the Gods who preside over creation, protection and dissolution. Thus God alone is the real Guru." Declared Baba. On hearing this Kelkar asked, "Should I worship Brahma, Vishnu, and Rudra?. Baba declared in a voice of assumed anger, "Eh Saitan! Here I am! Offer worship to Me!" Thereby Baba made known that He was Brahma, Vishnu and Rudra. All those present felt that Baba was the Divine incarnate. As days passed, the residence of Shirdi developed hatred towards Sathe because he was collecting all the offering to Baba in a Hundi so as to use the money to build a Mandir. Just at that time, a silver chariot with silver horses, which was in Sathe’s keeping, was stolen by some thieves. Sathe was the principal trustee. 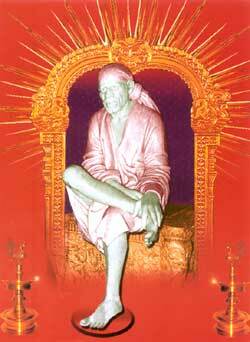 The people of Shirdi suspected Sathe of complicity in the theft. One day one of the residents planned to strike Sathe with an axe, on the way. Getting wind of this, his maternal uncle called Sathe and urged him to leave immediately as it was too dangerous for him to stay there. He told Sathe that he could worship Baba wherever he might be. Reluctantly Sathe left Shirdi. Baba used to ask for Sathe ceaselessly. But Sathe was not there. Baba appeared to be in great distress. Sathe was near and dear to Baba. The devotees felt that Baba was sorely affected by the absence of Sathe. Many people used to have doubts about Baba’s transcendental powers. One day, the birth anniversary of Dattatreya was to be celebrated in the month of ‘Margashira’ (9th month of the Hindu calendar), on Panchami (fifth day of the lunar calendar). Several devotees had assembled in Shirdi. A great and wealthy scholar called Balmant Kaijack was among them. As he approaching the masjid, Baba took his tick and marked it at the devotees, asking them to get away. He even beat some of them, shouting, "Saitan! Saitan!". No one could understand why Baba was behaving like this. "I am suffering labor pains. Get away, all of you! ", He shouted. In those days, Baba not only used to shout at people, but also wield the sick on them on occasions. He even used to throw the stick at fleeing persons. Everyone used to be afraid of Him. They all left the place. Sometime later, He called all of them to come. "Balmant Kaijack, come", He said.When Balmant came, Baba went inside the masjid. Balmant went in and found that Baba was not there. He found a three-headed baby on the floor. Baba had declared that He was suffering from labor pains and there was a baby there. The three-headed child appeared to represent Dattatreya. It was a small baby with a number of hands. Balmant recognized the child as Dattatreya and called other devotees to come inside. They went in, and on seeing the child, closed their eyes. At that instant, Baba reappeared there. From that time onwards, people started looking upon Baba as the incarnation of Dattatreya.